Is there a reason why you don't want to use your dissy triggers? Aem make a lower slot count disc for them. One you link to only has the home position reference, you would want one with multiple trigger wheel . Like ducie suggests, the lower resolution discs for standard distributor cas is a great and low cost way get cam reference . Thanks guys for you're input! But would it work, all i need from cam is reference point for ecu when to fire, right? Cam sensor in pic wouldn't work for sequential ignition, standard cas with lower resolution disc would and it cheap like less than 50euros . The multitooth cam trigger kits are probably more like 400 euro for not much benefit over a healthy cas setup . John from Nismotronic is working on a COP add-on option for his Nemu ADC board. As soon as it's released I'm making the switch from Nistune. No fancy $1500 standalone needed. @Ryaneg6freak wrote: John from Nismotronic is working on a COP add-on option for his Nemu ADC board. As soon as it's released I'm making the switch from Nistune. No fancy $1500 standalone needed. I know it will work but i was/am asking if that would work as well. There's plenty good/cheap ecu's around making good power. You need a trigger on the crank as well. Cam position like the pic is only #1 TDC position. Just be carfull as the wheel design for hall and reluctor sensors are different. Plus it's easy to wire both wrong so a oscilloscope trace is needed. 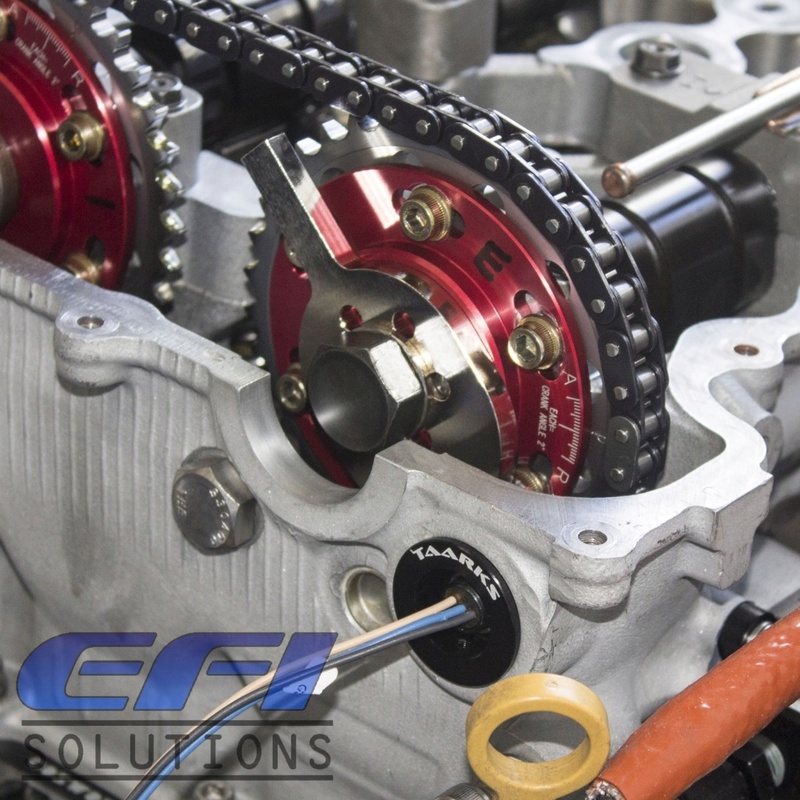 You need an ecu that has the ability to change the offset to correct timing position and to be able to keep constant delay over the rev range. You also need to make sure both the triggers don't have the teeth crossing each sensor at the same time. Whats the advantage of the lower resolution AEM disc? Excuse my ignorance but, isn't there any other Nissan with CoP that could be adapted to our engines with less hassle? Maybe off of an RB20DET for example? To go coil on plug all you NEED is a ecu that can drive smart coils. You DONT need to change the gtir dissy to run coil on plug. @ducie54 wrote: To go coil on plug all you NEED is a ecu that can drive smart coils. You DONT need to change the gtir dissy to run coil on plug. @gtir_woody wrote: Whats the advantage of the lower resolution AEM disc? You can get trigger errors at high rpm due to the super high stock tooth count ( 1 for every degree, 180 counts for 1 crank revolution) . Lots of ways do cop and will vary pending on components/type, I don't know all of them . reusing the cas and making the signal reliable is simple and pretty effective . lot of people used toothed crank with single cam reference but I prefer using the cas over a single reference cam gear kit . @ducie54 wrote: You need a trigger on the crank as well. Cam position like the pic is only #1 TDC position. Lucky for me I own a Snap On Modis Ultra 4 channel labscope. Inside the dissy under the rotor button there are 2 optical sensors. One reads cylinder tdc position and the other reads crank angle. Trigger 1 and 2 as some call it. I've used the stock dissy to run CDI. Buy a good ecu and a 2 channel osillicsope comes build in. Comes in handy when you need to check wiring polarity and set threshold voltages. "the trigger disc we made for the SR20 was essentially the same as the AEM unit and we found it worked well with a stock SR20 but with a modified engine it wasn't a 100% solution. Any time you're taking the engine position data from a distributor drive you're introducing some possible noise into the system. Inevitably there will be some backlash in the distributor drive as well free play in the cam chain itself. This can result in harmonics that may affect the accuracy of the timing"
The stock timing and injection all uses data via the cas which basically is a cam position sensor, reality is it pretty decent if cas mechanical components in good order. Even with cam gear mounted sensor you get some drift between cam and crank correlation due to chain lash ect. You can run most scenarios with just a cam sensor but you can't do everything with just crank as it still needs a minimum single reference from cam to know actual cylinder cycle . Your original concept of crank sensor and the single reference cam is good, you can reuse cas if it up to your needs. It's not just sync loss that can be issues. Engine Rate of change ROC should be consistent. LinkG4 shows this. For those on a budget and not after crazy rpm the stock optical sensors are fine. I ment 60-2 pattern sorry, but on mine ecu doesn't rly mater as I can set up custom trigger patterns and ecu got scope function as well which helps. And like Mr Ducie said if you're not going high rpm cas is ok. I think Link was working fine up to 8k (I might be wrong tho). "And my baad idea is try to go for 9k rpm. Just not sure what gonna let go first..."
I use cas at 8,200 rpm without issue but depends on cas condition and ecu ability process it . High tooth count crank can have sync issues too if get unlucky, exhaust cam multi trigger wheel is pretty nice reliable/easy setup over crank and cam triggers . My choices are standard cas, 36-1 crank and cam reference or cam pulley hall wheel .